HOW IT WORKS... it's as easy as 1, 2 and 3. Visit Club Premier and browse. We have hundreds of shops where you can earn Premier Points when you buy online. Simply click through from Club Premier to the retailer and buy online as normal. 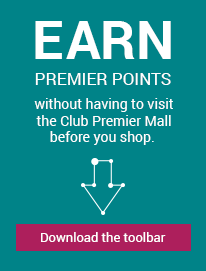 Club Premier retailers will let us know if you shopped and we will award you Premier Points within 40 days.